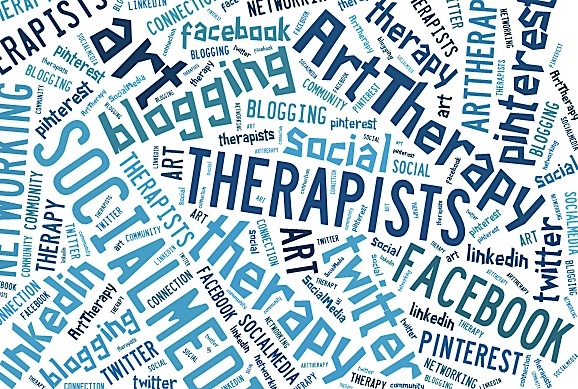 The American Art Therapy Association (AATA) has started to release a series of videos, Art Therapy in Action, that features credentialed art therapists talking about their work with a variety of populations, settings, and topics. 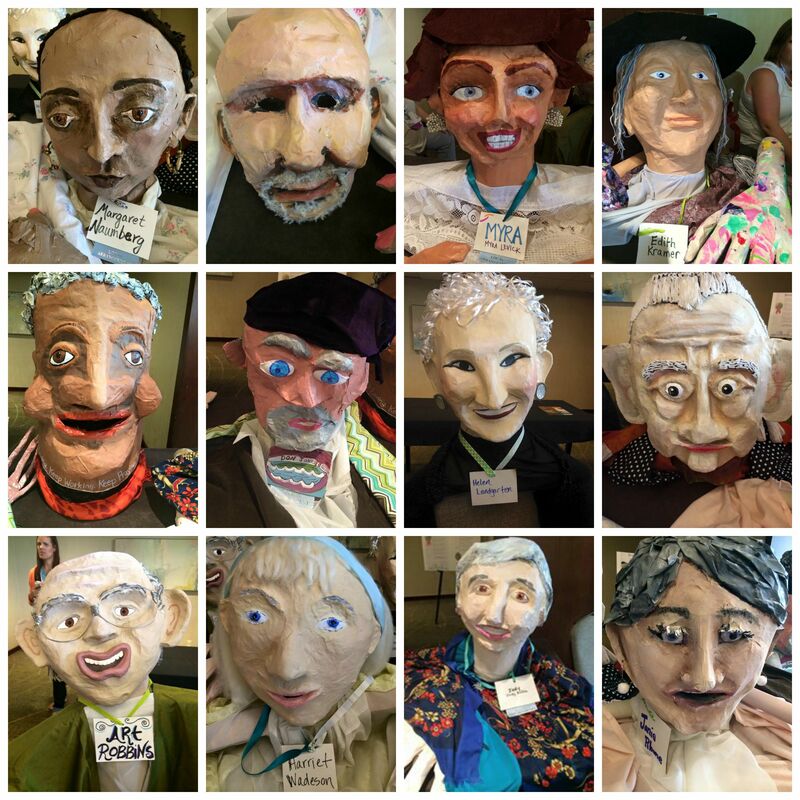 This series of interviews describe “how the unique and integrative properties of art therapy can enrich lives, support personal and relational treatment goals, address community concerns, and advance societal and ecological change”. If you are interested in learning more about how art therapists work, these videos offer a great look into the different approaches, applications, and ways art therapy can be facilitated. Future topics, interviews, and art therapists will continue to be added to this series, so stay tuned for more on AATA’s YouTube Channel or on the AATA website. This week the White House unveiled its budget proposal, which included completely defunding and eliminating the National Endowment for the Arts. This distressing news about the NEA and other programs that champion culture & humanities in the United States have increased art advocacy efforts into high gear to save the arts. The American Art Therapy Association (AATA) issued this statement about how defunding the NEA will effect clients who receive art therapy services from NEA sponsored programs and includes ways art therapists and art therapy supporters can take action. Contact legislators and let the US Congress (who approves the budget) to reject this proposed elimination of the NEA. This action alert from the Americans for the Arts includes an easy way to contact officials and you can also sign their petition to support the arts in America. The Atlantic, in its news piece The Real Cost of Abolishing the National Endowments for the Arts, states that “this kind of work can and should be bipartisan” and cites Second Lady Karen Pence’s interest in raising awareness for art therapy as her official cause as an example. Art Advocacy Day in DC (tomorrow and Tuesday, March 20 & 21) will be an important opportunity for art communities, organizations, and advocates to come together to share and showcase the critical role the arts has in everyone’s lives. The AATA is again one of the partnering organizations supporting these efforts. 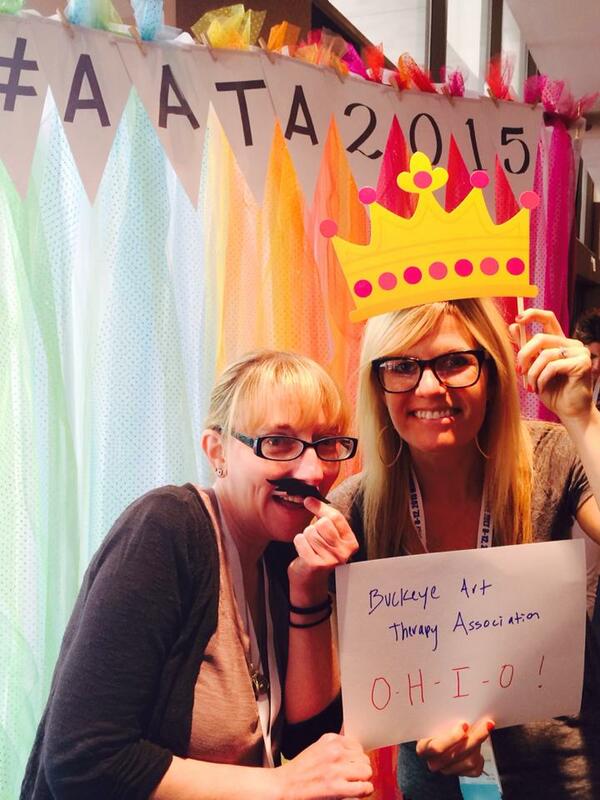 When I was a senior in college (1994), I joined the American Art Therapy Association. As a member, one of my favorite benefits was receiving Art Therapy: The Journal of The American Art Therapy Association. As a young student getting to know this profession, reading the literature inside was always inspiring. I also really enjoyed seeing what art graced the cover. Often the very first thing I would do was open the issue and look for the masthead about the art and what art therapist created it. So a few months ago, it was a huge surprise and honor to have the opportunity to contribute my own art for the last issue of 2015 (Volume 32, Number 4). In particular, an image from 2012 My Beautiful, Altered Brain series, which is super dear to my heart. This week, I was able to see and hold this issue in actual print while mine is still in route- a copy I received from the current President of the Buckeye Art Therapy Association (thanks Molly!). Wow! A very surreal moment on lots of different levels! Artist Statement: My Own Beautiful, but Altered Brain (2012) | A few years ago I came across the art and story of Elizabeth Jameson and was so very moved by her work, research, and interpretation of taking her own medical imaging and brain scans as a personal expression and inquiry to understanding and coping with her diagnosis with multiple sclerosis, as well as help others with the disease and educate the medical community through her art. Jameson put a call out for people living with brain inflicted illnesses to “feel how ugly it is and how beautiful it is”, and this invitation, in addition to personal communication with Elizabeth inspired me to explore my own experience with the same disease. 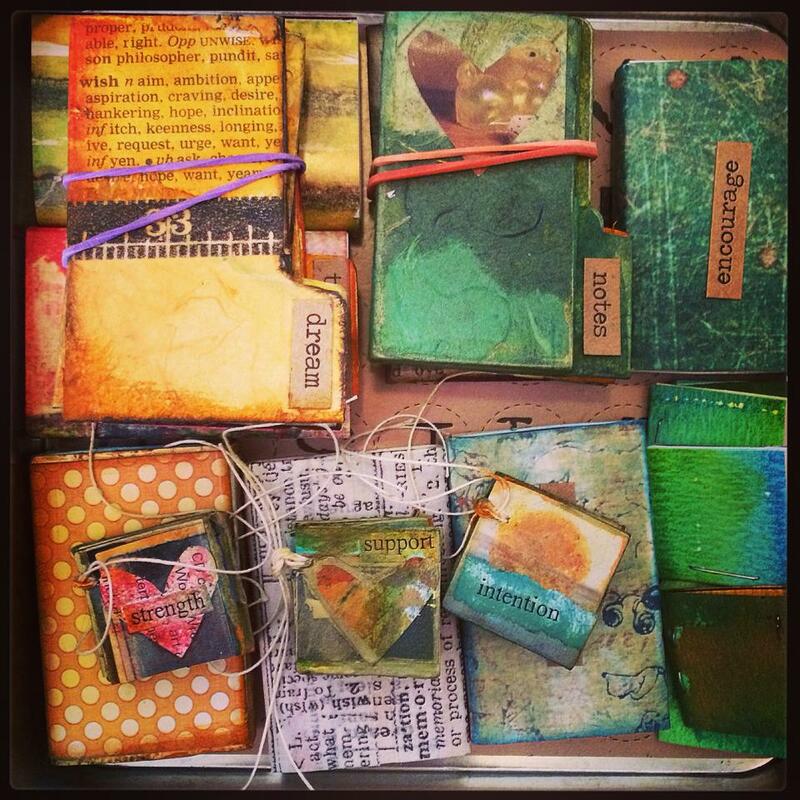 In 2012 I started to use my own MRI films & brain imaging collected over the last 13 years to create digital art, mixed media, and altered book art as a way to process, manage, and share this health related journey. I have been working on some new digital art, after having another MRI done this summer of my brain and spinal cord. While standing barefoot in my thin medical gown after my testing was over, I enthusiastically explained how I make art with my imaging, its purpose, showed some examples on my phone, and inquired about how to get these new images. The radiology staff was super helpful and eager to supply me with a CD on the way out of my appointment! 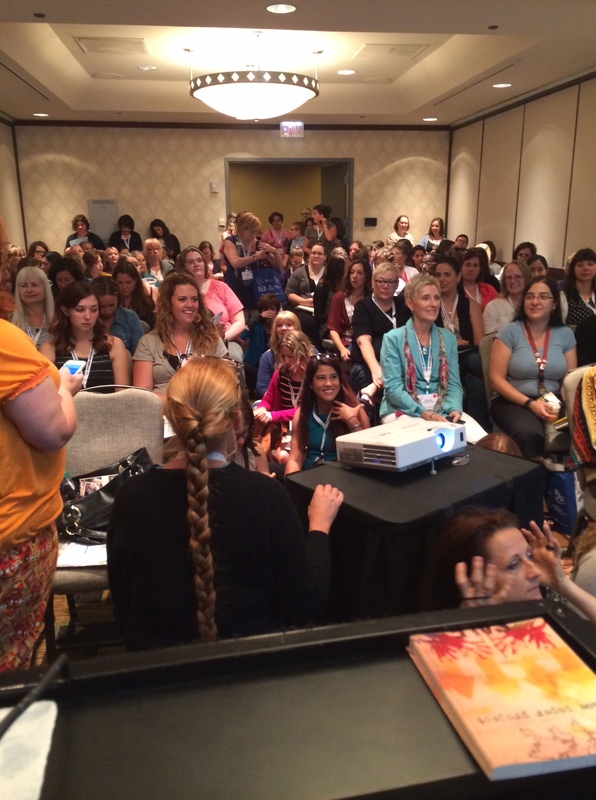 July 1: 6 Degrees of Creativity’s 2015 virtual workshops open! Yay! As part of this year’s offerings, I am excited to launch a new workshop dedicated to discovering the hidden creativity around us. My curiosity around this topic was first sparked by this recent post and something I thought would be a fun endeavor to embark on together as we search for uncommon or unknown ways, forms, and different examples of how creativity can present itself. 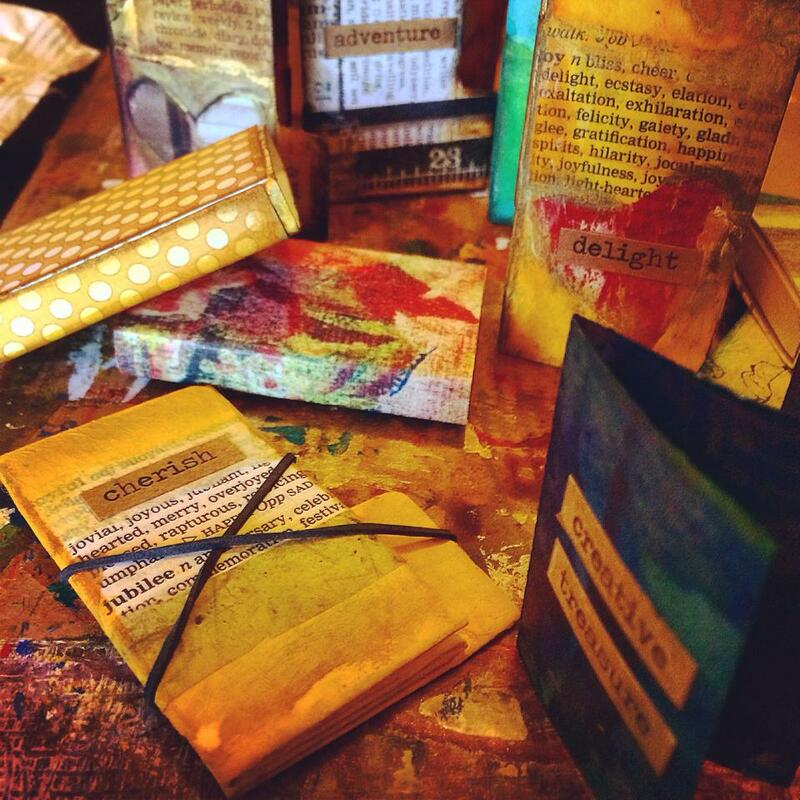 I am also looking forward to the offerings that art therapy colleagues Sheila Lorenzo, Rachel Mims, and Heather Randazzo will be inviting participants to engage in as well, which include workshop topics on self-care through art & nature, recycled art & mail art fun, and yoga & art. and creating connection for art therapists worldwide. 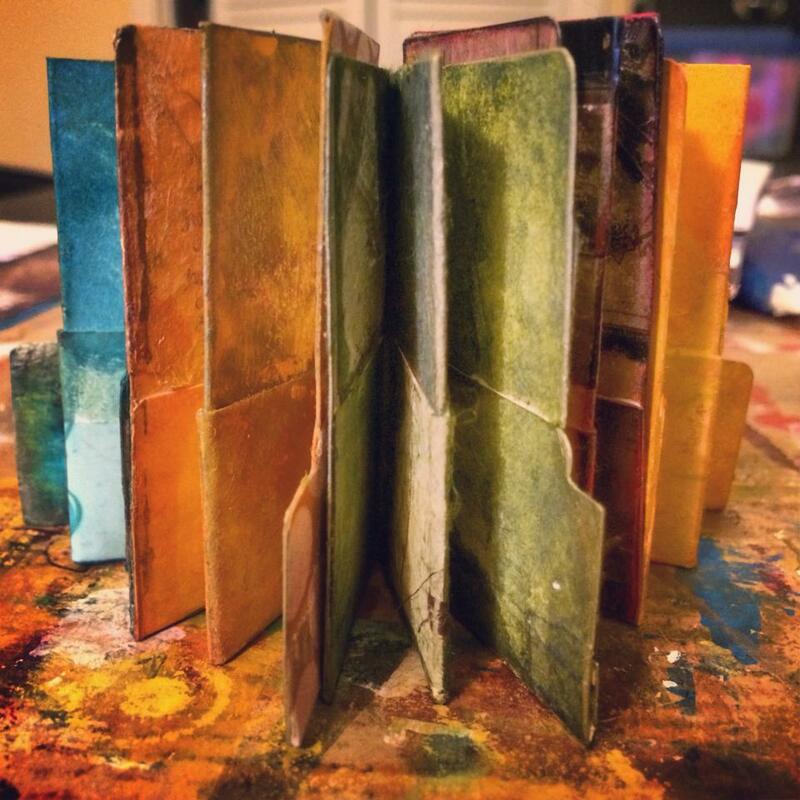 Art, Transformation, and Trauma: Papermaking as Art Therapy: Friday, July 10, 10:15-11:45 am: I will be moderating this panel featuring the work of art therapists who use papermaking inspired by the social action and art-based mission of the Peace Paper Project. Panelists include Meredith McMakin, Rachel Mims, Amy Bucciarelli, Genevieve Camp, and Janice Havlena. 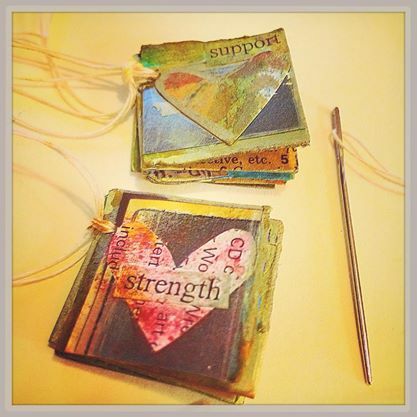 Content will include papermaking as a form of trauma intervention, including vignettes addressing eating disorder recovery, managing illness and disability, grief and loss, and working with veterans. Ethics of Identity in Digital Culture & Art Therapy: Saturday, July 11, 10:15-11:45 am: I will be contributing to this panel with art therapists Megan Campbell, Moriah Lancaster-Laird, and Natalie Carlton about topics connected to digital technologies and ethical considerations for the art therapy profession. 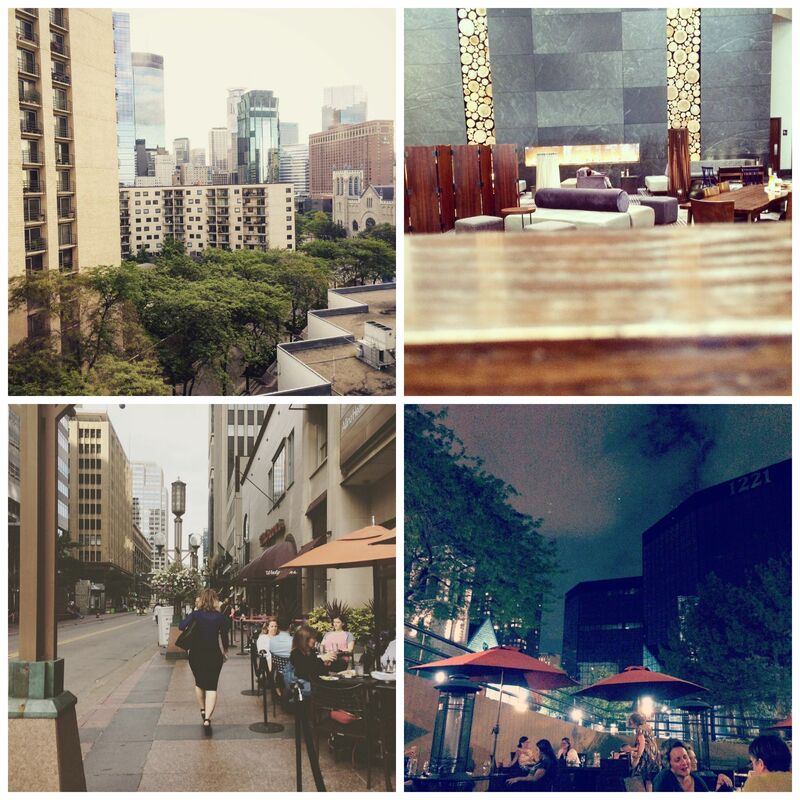 I am also looking forward to bringing Creative Deed 365 to Minneapolis and invite you to consider joining us if you will be attending the conference! 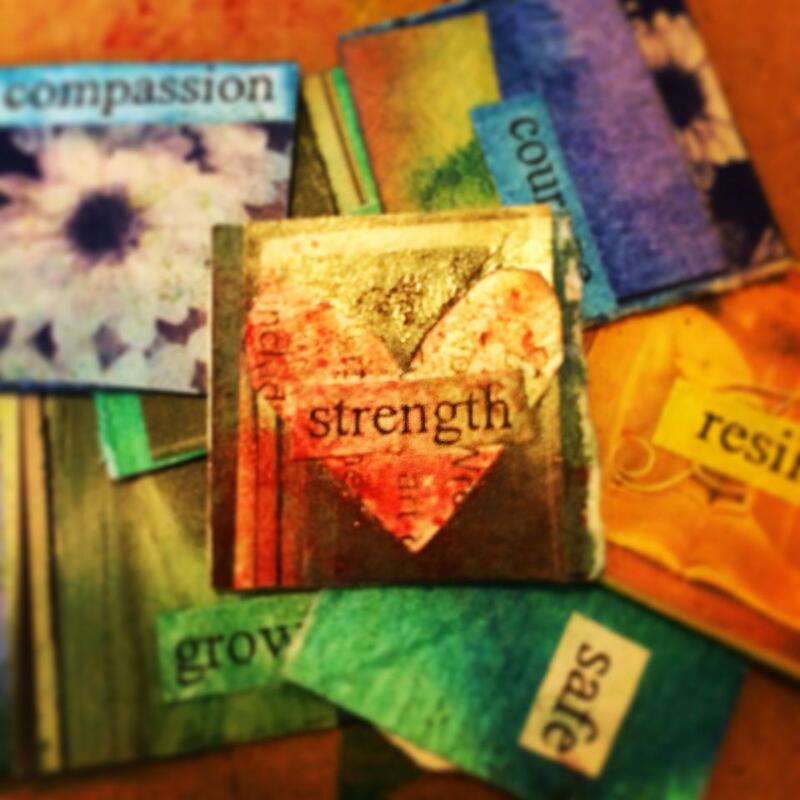 July 24- ADAMHS Board of Cuyahoga County Trauma Collaborative: I’ve been invited to present on Art Therapy & Trauma Intervention to members and agencies who attend this quarterly meeting. 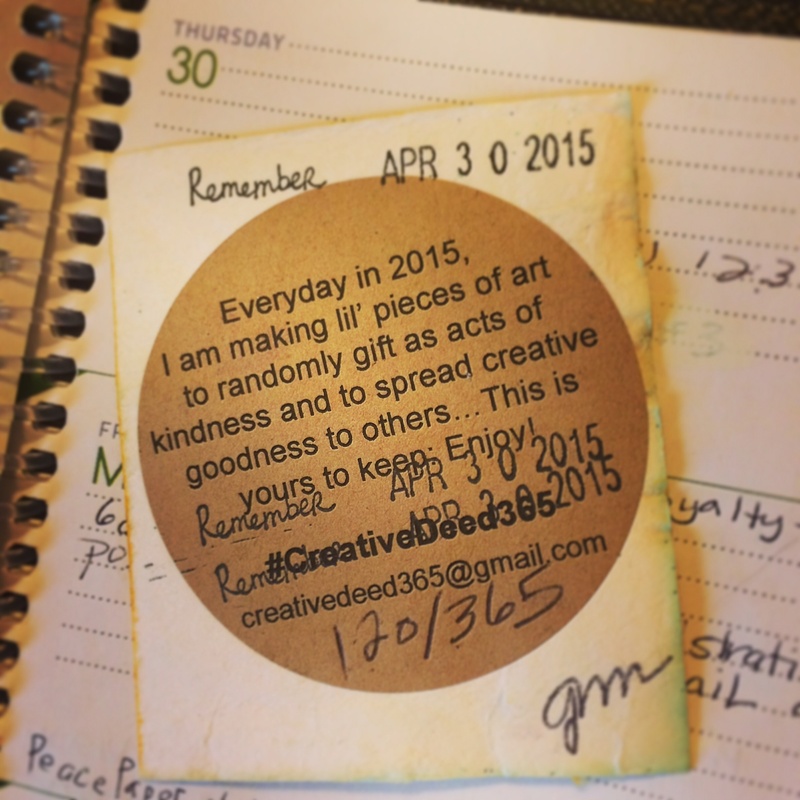 Stay tuned for other updates and art from Creative Deed 365 and the Random Acts of Art Adventure, in upcoming summer posts as these creative pursuits carry on! And I hope to be able to share some of the wonderful work in the spirit of my Creative Covenants workshop happening over at Hali Karla Arts’ Spectrum too. And, right around the corner….Daisy Yellow’s ICAD 2015 begins June 1 – Wondering if I should combine my creative deed making with daily index card creating for this fun annual event? Hmmm…. more on this in my next post! Summertime creativity is definitely in the air! 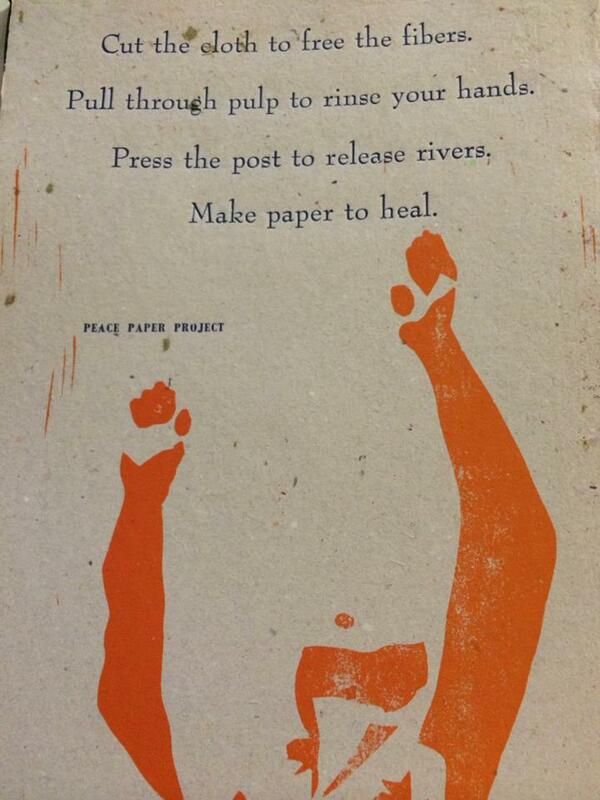 When it’s hot…Make some paper! Coming this summer…. 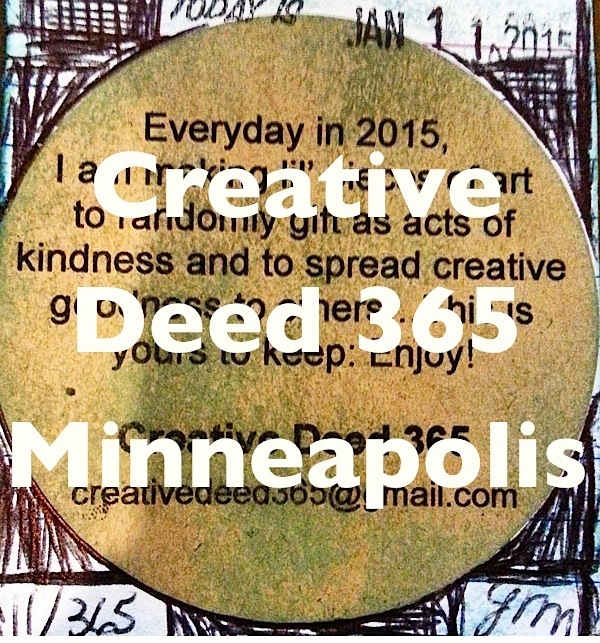 Creative Deed 365 Minneapolis! 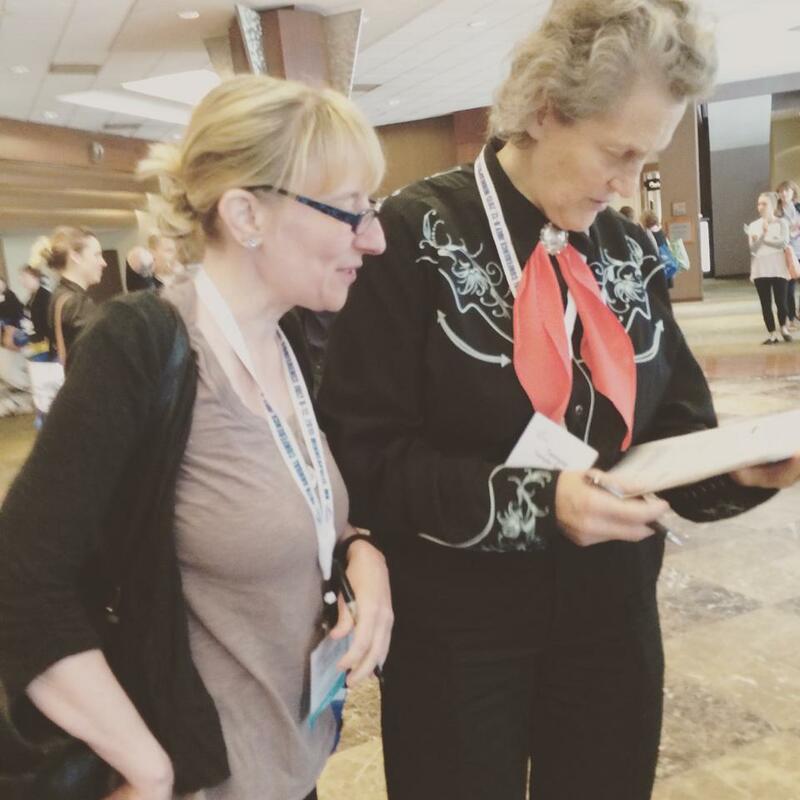 This summer, the national art therapy conference will be held in Minneapolis, Minnesota July 8-12. I’ll be attending and also presenting, as well as keeping up with my creative daily practice of leaving creative deeds for others to find while away. I thought it would be fun to see if other art therapists and art therapy students also planning to attend this year’s conference would be interested in leaving their own creative deeds and creative goodness throughout the event during these five days. Wanna join in? Creative Deeder: If you are interested in making and leaving Creative Deed Art, just make one for everyday of the conference and leave one each day in a random place onsite at the conference for another attendee or hotel visitor to discover. 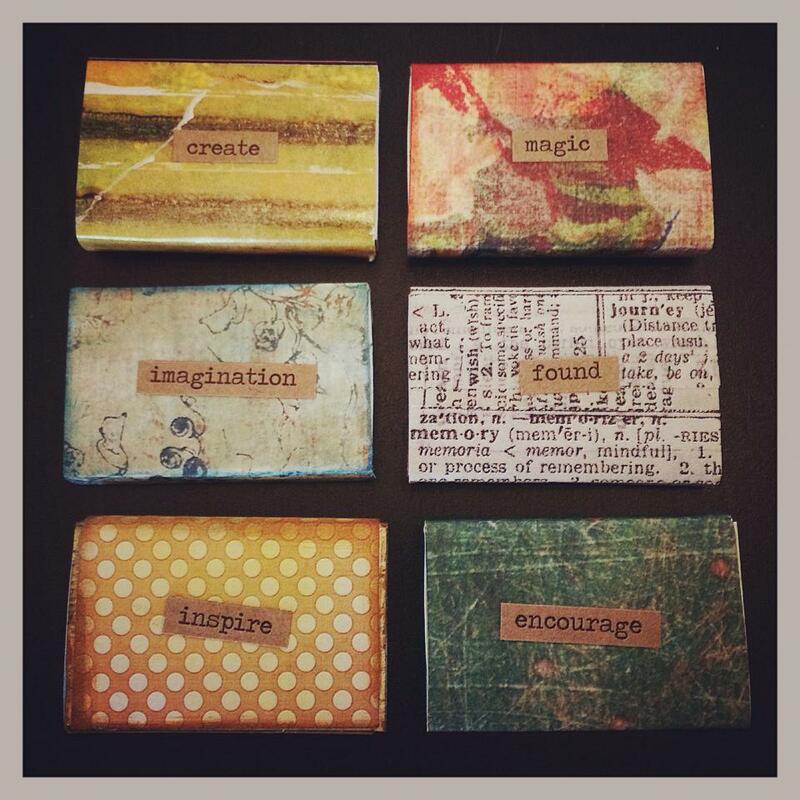 Creative Deed Art includes inspiring and encouraging handmade pieces of creative expression, infused with messages of kindness, hope, and positivity left behind for unsuspecting others. 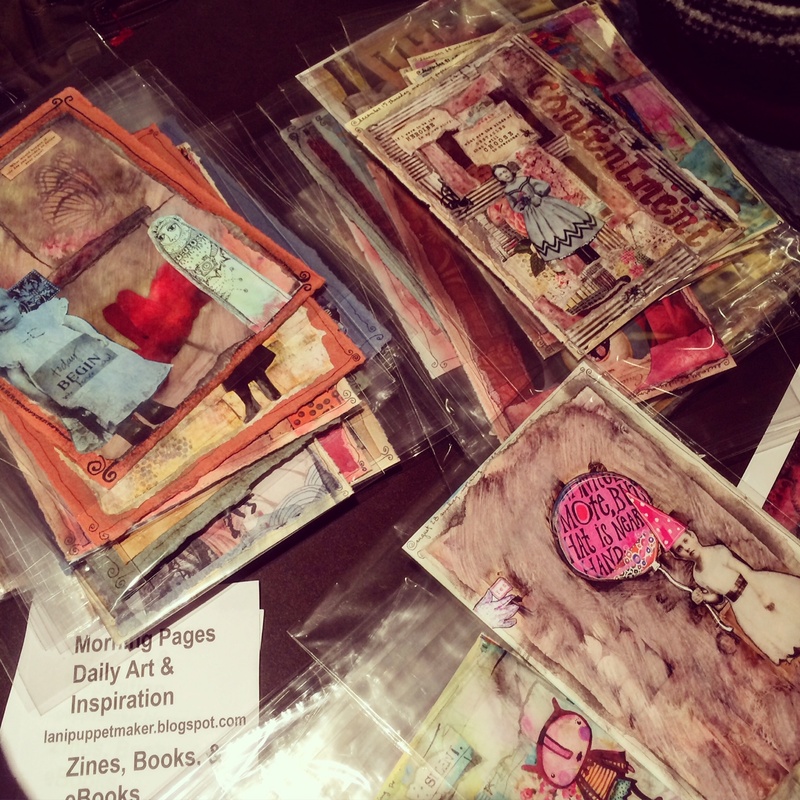 Throughout this year in the Creative Deed Facebook Group, members often create artist trading card or index card size art, but there’s really no particular form or size. I’ve been making my daily pieces of art with half size index cards, playing cards, and handmade paper cut to 3 x 2.5 inches to keep my practice manageable, both in the making and releasing. I also include a simple label on the back of each card that explains the intention of the project and what was just found. 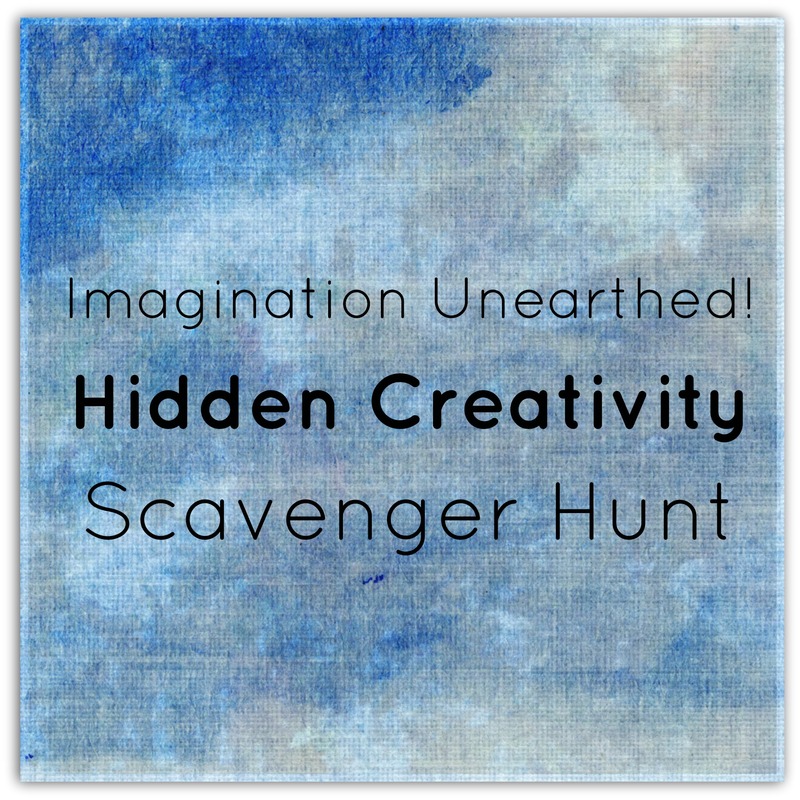 Creative Deed Finder: If you find a creative deed while in attendance at the conference, use social media to let everyone participating in the project about your creative find using the hashtags #found #creativedeed365 #minneapolis. Let’s keep the energy going virtually! You can also RSVP on this FB event page to be alerted of updates, ask questions, or get more information related to this fun adventure as it gets closer and happens onsite! If you have any questions, feel free to e-mail me at creativedeed365@gmail.com. 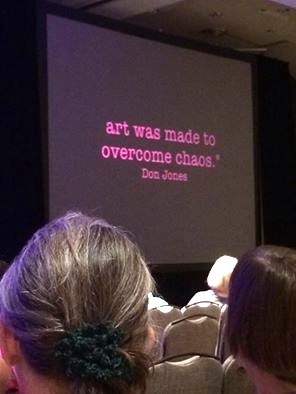 Next week I’ll be heading to San Antonio to attend the national art therapy conference and I am looking forward to opportunities for learning, connecting, and community building. Early on at the conference, Andrea Davis, LPC, ATR-BC and I have organized an artist trading card exchange and meet up exploring the theme of art therapy dreams. I am eager to spend time swapping art and re-connecting/connecting on site with art therapists and students I’ve met through the 6 Degrees of Creativity or Art Therapy Alliance communities, as well as meeting some new faces and enjoying the creative company of friends. I hope this gathering will be a great space for networking & coming together through creativity! 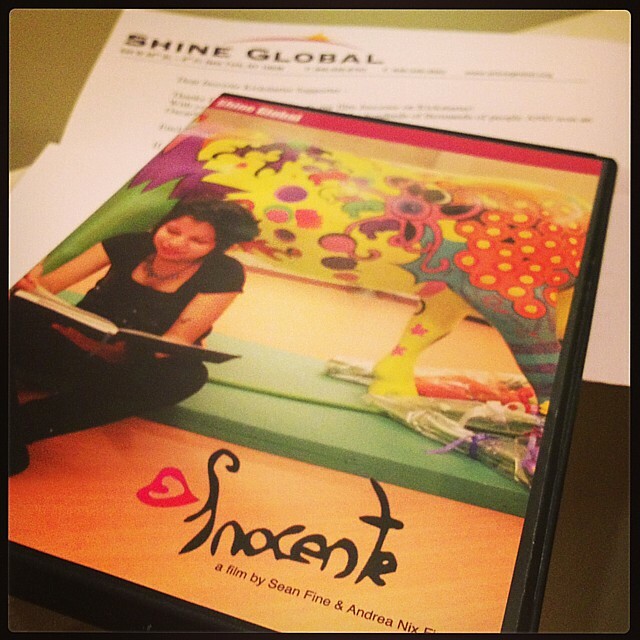 Following the Marketplace fun, I am looking forward to attending the free screening of Inocente and have the honor of leading a discussion following the film with audience attendees about the role and benefits of art expression in helping youth living with homeless. Don’t miss out on seeing this inspiring and Academy award-winning film from 8-9:30 on Thursday evening- I hope to see you there! 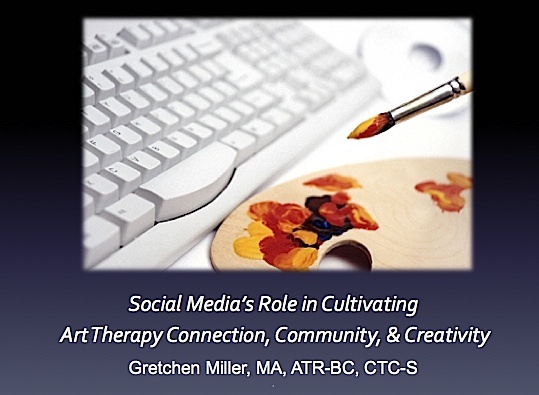 On Saturday morning (10:30-11:20 am), I’ll be facilitating a Focus Group on one of my favorite topics: Social Media’s Role in Cultivating Art Therapy Connection, Community, & Creativity. 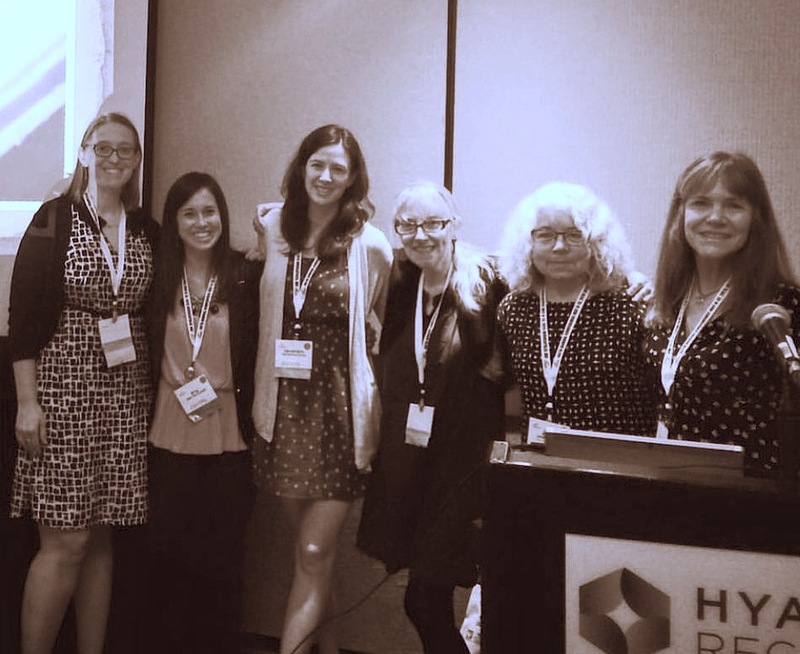 This focus group will stimulate innovative dialogue about social networking’s important role in building community, cultivating creativity, and creating connection for art therapists worldwide. 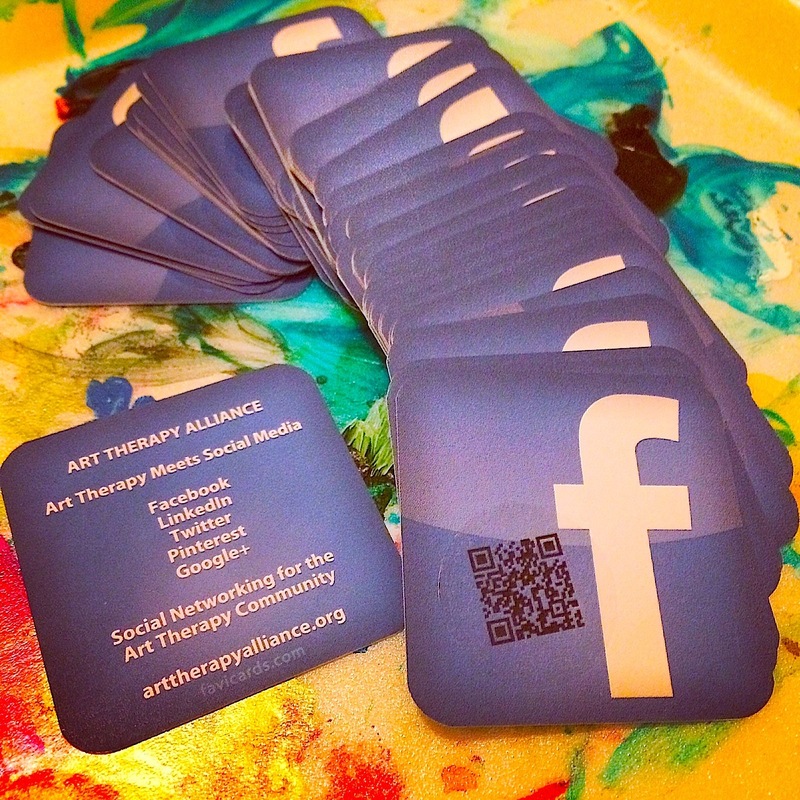 Participants will engage in discussion about the power of social media to mobilize and engage a community, as well as how to leverage this participation to bring art therapists together for art-making, support, and crowdsourcing efforts. Discussion content will include websites, groups, and communities available on-line for art therapists and how to professionally get the most out the social media experience for networking, empowering creativity, and sustaining a sense of community and belonging. And finally, if you want to join in on the conference’s social media activity while in San Antonio, AATA’s Social Media Committee will be hosting Pop Up Photo Taking & Hashtag Creative Fun in the Exhibit Hall @ the Marketplace of Ideas during Networking and Lunch Breaks Thursday, Friday, and Saturday. You are invited to stop by! Also, if you will be in attendance at the conference and want to share your updates, check-ins & photos, use the event’s hashtag #AATA2014 ‬ on Twitter, Instagram, and on FB. I hope our paths will cross at one of these happenings or at another offering throughout the week if we are both in San Antonio! 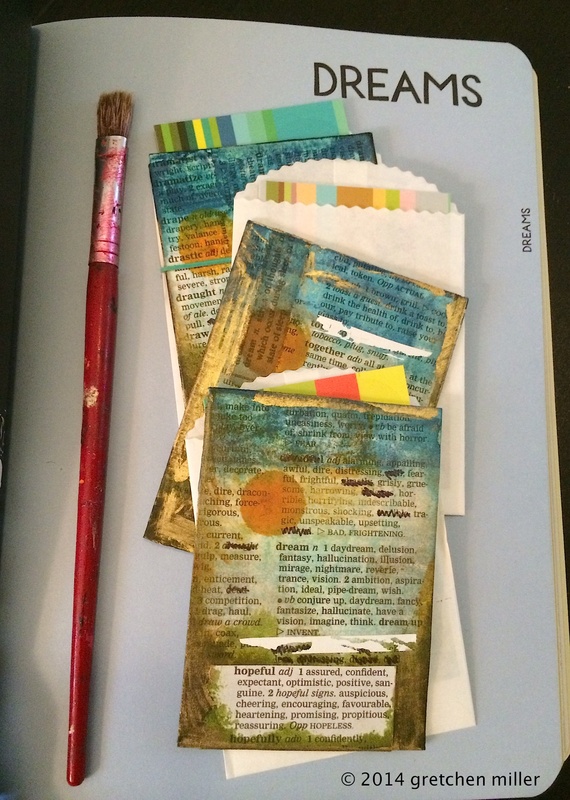 Coming this Summer….. An Artist Trading Card (ATC) Exchange and Meet Up in San Antonio, Texas co-organized by Andrea Davis, LPC, ATR-BC and me…. Make, Swap, & Meet Up! 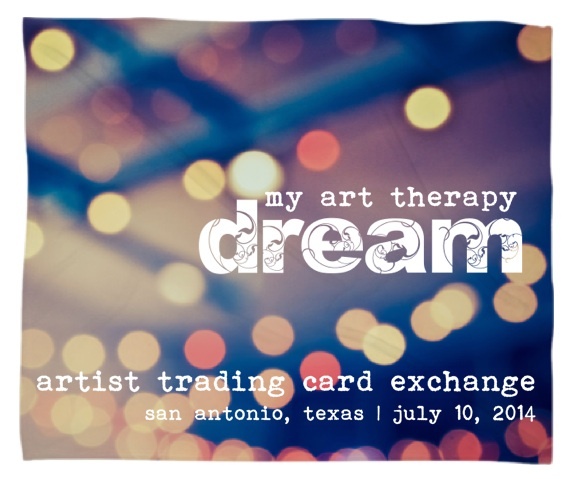 This Artist Trading Card (ATC) Exchange coincides with the annual American Art Therapy Association Conference this July in San Antonio, Texas. If you’ll be at this year’s conference, you are invited to participate and spread the word to others who might be interested in this swap and networking opportunity. 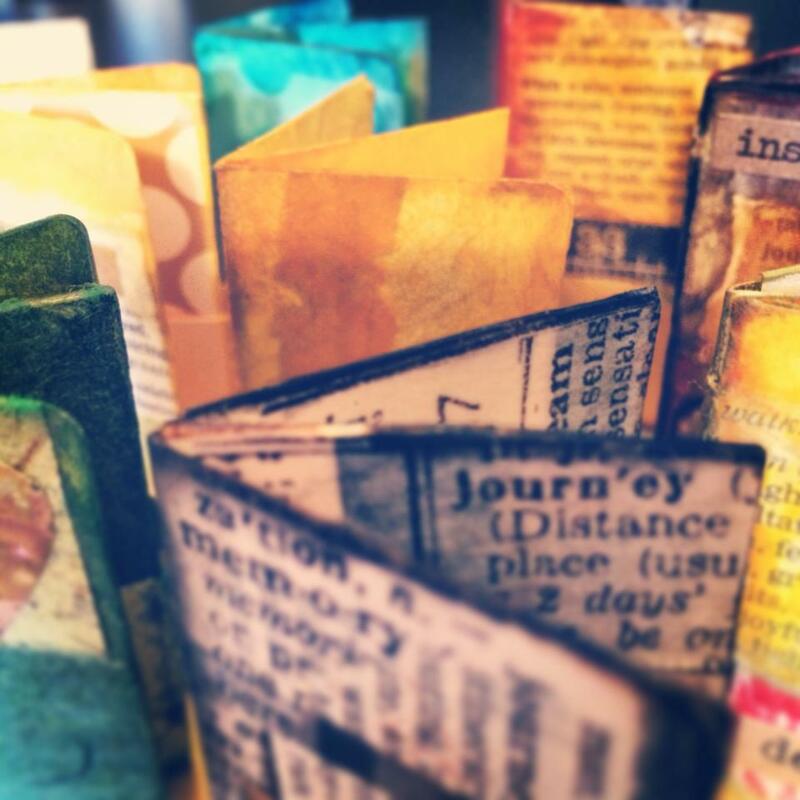 Meet up in a fun, creative way with others from the art therapy community to swap some art! You will create 3 Artist Trading Cards to exchange with 3 other community members who are participating in this exchange in San Antonio. Create 3, Receive 3! Please make sure your ATCs are created prior to the swap. Your ATCs can include the same image, but all must be original. 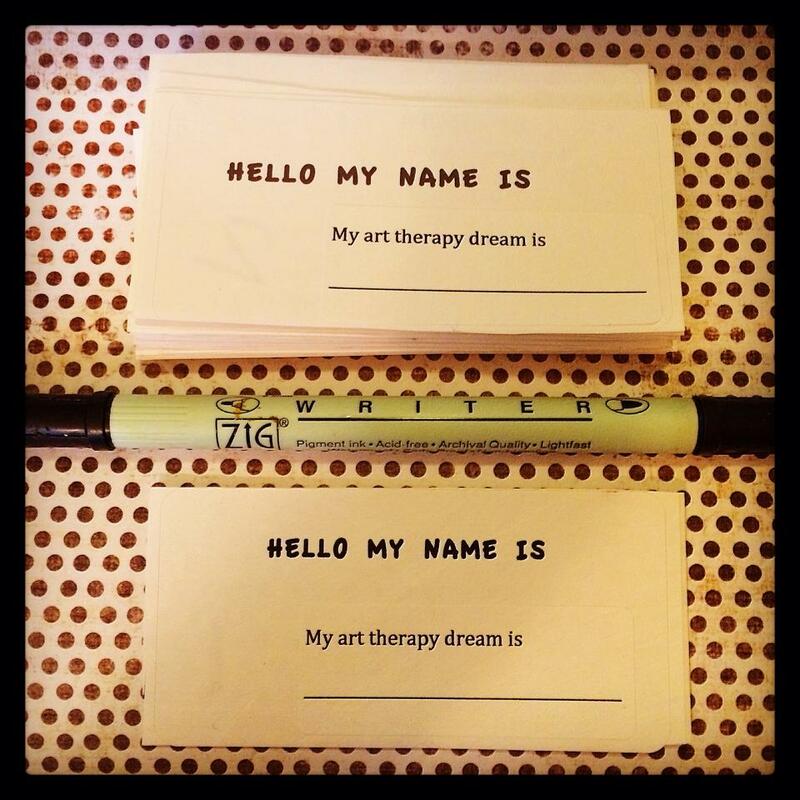 This swap’s theme: Art Therapy Dreams: What wishes & dreams do you have for art therapy and your work as an art therapist? The dimensions of your ATCs should be 2.5″ x 3.5″. Tips, examples, techniques, and more can be found via this how-to. On the back of each ATC you can include your name, city, state, and contact information in the form of a blog, website, or email. Exchange Site: Participants will bring their ATCs to the Conference’s Marketplace of Ideas (Exhibit Hall) on Thursday, July 10 during lunchtime. 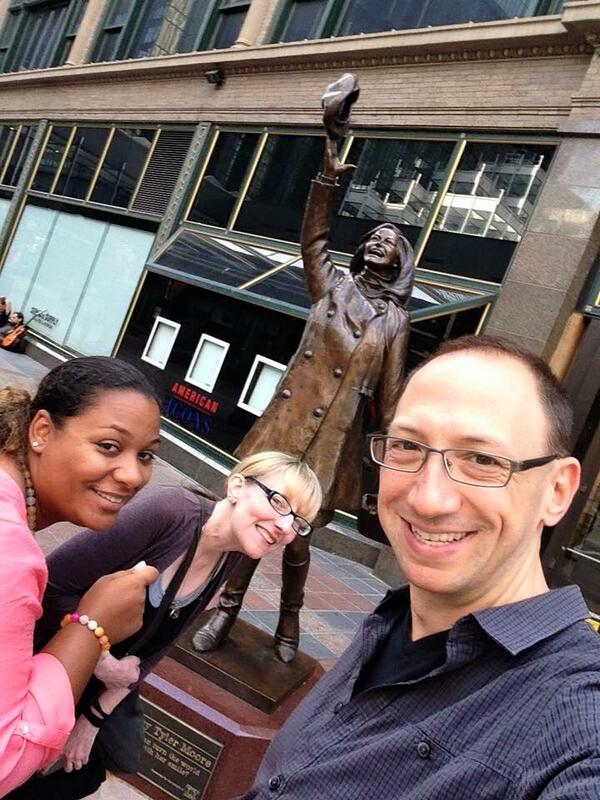 A great time to eat lunch, meet up, swap, and network together! ATC Swap begins at 12:30. 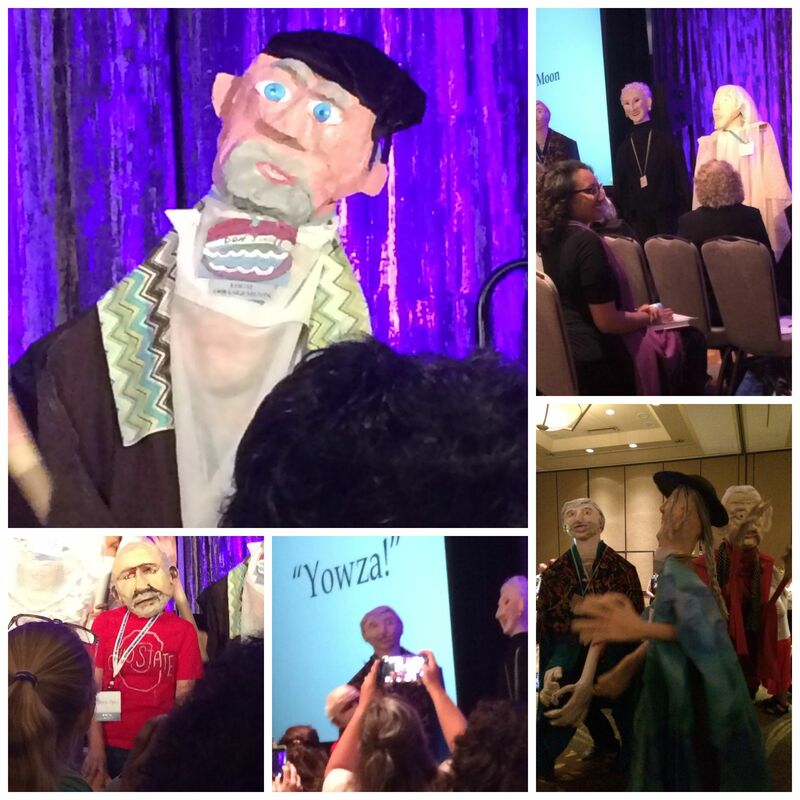 To Sign-Up: If you’ll be in San Antonio for the Conference and are interested in participating, (or have any questions) please e-mail me at info@arttherapyalliance.org with your name and e-mail address to sign up.